Members of the Order of the Arrow perform a Native American grass dance as part of an educational program at the Garden Ground. BSA photo by Jeff Hattrick. The most popular area was the Highland Games, where Scouts, Venturers and even staff took part in Scottish heritage and games. The Games included the caber toss, where Scouts threw tree-sized poles; the hammer throw; tug-of-war and many other Scottish events. Participants also interacted with the kilt-wearing staff running the games — many of whom are actually visiting from Scotland — and Scouts and Venturers could even learn how to properly wear a kilt on themselves. Another area was the Native American Indian Village, staffed by brothers of the Order of the Arrow. 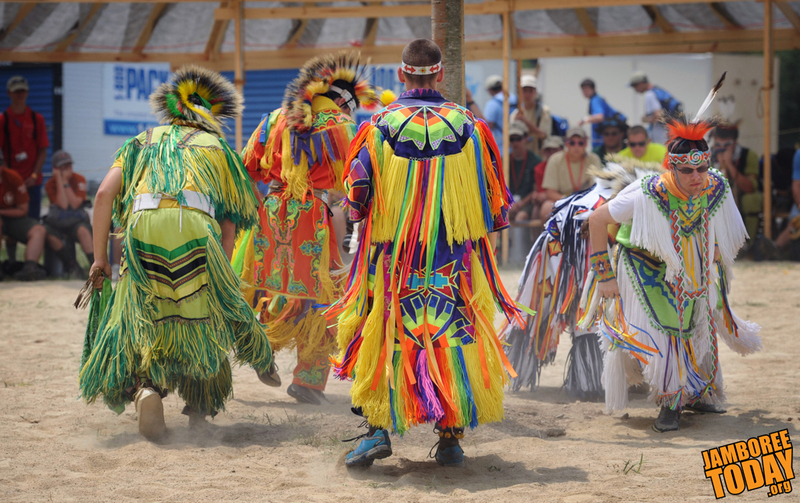 Here, Scouts experienced Native American dance performances, created historically representative crafts, and played games. Samuel Herndon, another staffer at the Native American Village, is an talented bead artist who has been studying Native American culture since he was eight years old. "I make my work for decoration and display, not profit," said Herndon. "It is all to show the scouts and help them learn about culture." Scouts and Venturers who missed the Garden Ground at this jamboree are invited to return to the Summit Bechtel Reserve for the 2017 National Scout Jamboree, perhaps even as staff members for the Garden Ground.